In 1855, while working as a journalist, he self-published the first edition of Leaves of Grass, which consisted of twelve untitled poems and a preface. During his subsequent career, Whitman continued to refine the volume, publishing several more editions of the book. At the outbreak of the Civil War, visited the wounded at New York-area hospitals. He then traveled to Washington, D.C. in December 1862 to care for his brother who had been wounded in the war. 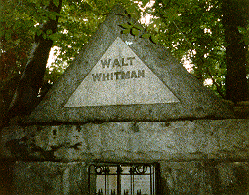 Whitman began his career as a male nurse while in the battle zone at Fredericksburg, Virginia, where he found his brother recoving from a superficial facial wound. He was greatly moved by the suffering of the wounded men in the battlefield hospital and volunteered to work as a nurse. He quickly earning the trust and respect of the doctors at the battlefield. On his trip back from Fredericksburg to Washington, right after a somber New Year’s Day 1863, Whitman was put in charge of a trainload of casualties who had to be transferred to hospitals in the capital. While the wounded were being moved from a train to a steamboat for the trip up the Potomac, Whitman wandered among them, writing down their messages to their families, promising to send them, comforting the soldiers with his calm and concern. Perhaps by the time he got to Washington, determined to stay a few days in order to visit wounded soldiers from Brooklyn, he already knew at some level that he would have to remain there for the duration of the war. Overcome by the suffering of the many wounded in Washington, Whitman decided to stay and work in the hospitals for the duration of the war. He always insisted that he gained more from the soldiers than they received from him; he considered those years of hospital service "the greatest privilege and satisfaction . . . and, of course, the most profound lesson of my life." "The Wound Dresser," one of Whitman's "Drum Taps" poems, describing his service as a nurse during the Civil War, have been described as "an eloquent and passionate celebration of caring, certainly one of the canon of poems about nursing. For those who argue that nurses and physicians ought to develop detachment and 'clinical distance,' this poem is a kick in the pants."